Polka dot, our new puppy dalmatian loves playing in the garden and can often been seen burying bones. There is one though that she carries with her just in case she feels a bit peckish. 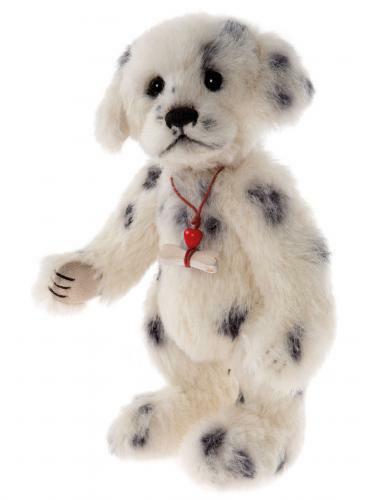 She is fully jointed and can stand or sit (as she has now passed her puppy training classes) and has been made using a soft white mohair that has also had black spots added to it. The mohair we have used, because of these lovely spots, will be random so you will be able to choose your own puppy as all will be unique. If you like this bear then you should also check out their bear family Cassie, Fetch and Paws.